If you need a car-related reason to come to Japan for a week or so, the Tokyo Auto Salon is one of the best events to plan a trip around. Not only is it one of the most entertaining car shows in the world, the weather in January isn’t even too bad. It’s certainly better than the horrendously humid summers Japan gets. The other great thing about the TAS weekend is all the events, parties and car meets that represent this country’s wild tuner scene. To kick things off, I did the RWB New Year’s Party on Friday night immediately after the media day of TAS was over. On Saturday night I went to an “underground meet” at the car park of the UDX building in Akihabara, and of course on Sunday morning, I did meet at Daikoku. You don’t really need a reason to visit Daikoku on a Sunday morning because you’ll never know what will show up, but on this occasion it was a pretty good turn out. It’s almost tradition for the RWB New Year’s Party to not actually be held near New Year’s Day, but two weeks later during TAS weekend. I’ve been to this meet a couple times before and the scene around these wild and polarizing Japanese Porsches keeps getting bigger and more popular. Last year there were about 18 cars and a handful of foreigners. This year there were easily more than 20 cars, and foreigners outnumbered the locals. It’s not like RWB keeps quiet about this meet—they advertise it on the “official but not official” Facebook page in both Japanese and English. Regardless, maybe the locals have better things to do on a Friday night. What was unusual about this was the RWB was usually held the night before TAS, but this year it was held on the first night of TAS. Not that it made a difference to the attendees. The cars arrived around 7 p.m. and kept coming until they had dinner at around 9pm. Luckily the restaurant was nearby so they just left their cars in the car park of the Hard Rock Cafe in Roppongi. Having all of these RWBs together, seeing all the different variations to each specific car was more noticeable. Each kit costs roughly $25,000 excluding installation and all the prep work done by you or your local shop. Nakai-san will only make one car for each customer too, which certainly adds to the “mysteriousness” of the cars. The RWB family is an ever growing one and seeing all the people driving then was rather interesting. There wasn’t a particular “type” of person like there is with, say, Liberty Walk cars. There were old and young drivers, men and women. Some came in a convoy, others arrived solo. I did wonder what made them want to get a RWB, whether they saw it in a magazine, saw one on the road or played with it in a Need For Speed game. Taking donations to buy a 22B now. Thanks. This meet wasn’t actually an “underground meet” but rather a meet that just so happened to be actually under ground. But it was sort of underground as well, as I didn’t know about until it was actually happening. Information was spread through word of mouth but apparently this meet has been happening on the weekend of TAS every year. It was my first time going to an actual meet at the UDX car park, I’ve visited a couple of times just to check out what was inside but never for a meet. Most of the cars were gathered in the B2 floor though there were also a couple on B1. What made it even more amazing were the signs saying “No Photography” on the wall, but as far as I could see everyone else was taking photos and security hadn’t come down to kick anyone out. Ask for forgiveness instead of permission, I figured. For a so-called “underground meet” it was pretty civilized, nothing like the one I saw in California last year. This is the meet for all the JDM lovers out there. Apparently we got there a bit late and most of the cars had already left by the time we got there. That said, the cars that stayed were pretty decent. It was basically like an annex of TAS. There were mostly stance cars but, being Akihabara, a few itasha cars for good balance too. Unlike the RWB meet, it was mostly locals here with a few visitors from overseas. There was a good mixture of cars from RX-7s, Integras, GT-Rs, and even Daihatsu Copens to a Mercedes 190E, E30 BMW 3 Series, and more modern M3s. These sorts of meets are always good to see because last time a meet was held in a car park it made the news. Last year the annual Super Street meet in Odaiba was shut down by the police for, well, behavior you wouldn’t expect to see in Japan. There were bikes doing wheelies, Camaros doing burnouts, and noise complaints from locals. Maybe that explains the quiet behavior at this meet. Unlike the other two meets which you can get to on foot, this one requires a few more resources. The easiest way to get there, and I tell this to everyone that asks, is to rent a car. That requires you to have an International Driver’s Permit though. However, there were a few keen guys from Canada who took a train to Yokohama then got a taxi to take them from Yokohama to Daikoku which cost them around $30. The problem was getting a taxi back. Regardless of how you get there, Daikoku on a Sunday morning is always worth a visit. I suggest getting there around 9 a.m. and just chill and wait for things to show up. It wasn’t as full as I had expected when we arrived, so we just sat in our rental and waited. Then we saw a bright yellow shape come down the entrance ramp; it was the yellow Ferrari F50 from Anija. Whether or not he would park was key; if he just came and did a loop it meant he just popped by to have a look before heading off somewhere else. However, if he stopped, that meant more were on their way. He parked. Not even 15 minutes later another F50 showed up, this time in white. I’ve seen this particular car before, most recently at the Hanyu New Year’s meet. It was great to see these two together again after a long time. But if two F50s weren’t enough, a third one arrived in the more conventional Rosso Corsa. This being Japan, however, it also had custom Speedline wheels. At this rate I would’ve considered this morning to be a success, but Daikoku wasn’t done. While we were distracted by three F50s, a lone F40 hiding in the back nearly snuck past us on his way out. But no worries, because soon after he left, the F50 crew also brought along a friend in another F40. It was just complete madness. Eventually I stopped weeping openly at the sight of so many F50s and F40s and had a look around the rest of the parking area. There was a Lamborghini meet too with a Huracan Spyder, a couple of Countachs, a Murcielago SV, and a slightly modified Murcielago with a wing. Pretty standard stuff. Around noon the Lambos left. The Ferraris followed suit soon after, they were probably on their way to the last day of TAS. 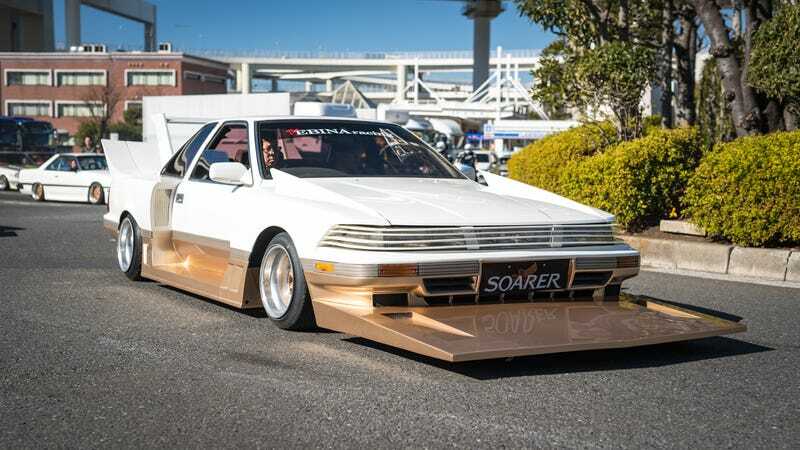 Then the real surprises arrived; around 25 bosozoku cars arrived, revving their engines. I heard them before I saw them, which is quite a feat considering some of them had multi-story wings and skyscraper-sized exhausts. Like the “vanning” vans at the New Year meet at Daikoku, these bosozoku cars rarely come out for any reason, so seeing one is uncommon. To see this many gathered at once during the day is something I’ve never experienced before. These cars rarely come to Tokyo, so a proper close-up look at one so having 20 was a treat. If I were to pick one week which sums up the car scene in Japan, it’d be the TAS week. It’s one of my favorite events of the year anywhere in the world, and all the extra meets and parties are a bonus. There’s also plenty of time to plan a trip for 2019. You should make it a priority.